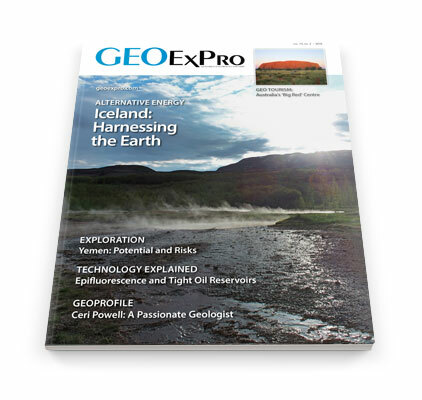 This edition of GEO ExPro magazine focuses on Europe, New Technologies and Alternative Energy. Peace is bringing hope, seismic exploration and evidence of exciting hydrocarbon-bearing structures offshore Somalia. Good sediment thickness; multiple trapping mechanisms; excellent energy-hungry markets nearby; and large areas available for leasing: time to take a look at underexplored Portugal. GIS databases are a powerful tool for minimising exploration risk in Iranian hydrocarbon basins through geospatial analysis. Executive Vice President of Exploration for Shell, Ceri Powell, talks to us about her life and career - and how it felt to be described (in Fortune Magazine) as the 21st most powerful woman in the world. Oil production in Western Europe increased for the first time this century. What Chance a Production Freeze? Shale oil and gas were considered rarities ten years ago. In the future these resources will constitute a sizable share of the market. Joe Green and Rasoul Sorkhabi, Ph.D.
A new book on the history of the upstream petroleum industry is itself a groundbreaker in a fascinating field. Enabling an enhanced regional perspective and revealing new potential plays. Can an unexplored sedimentary basin be unravelled by gravity? How can gravity in cross-disciplinary workflows estimate the base of salt domes and gas saturation in shallow sedimentary traps ? Read on! ‘Big Red’ country, encapsulated in Australia’s first National Landscape - Australia’s Red Centre is now being recognised as a major draw for global travellers seeking outstanding geotourism experiences in the country. Iceland is one of the pioneers in the use of geothermal energy, both for heating homes and generating electricity. IPIECA is the global oil and gas industry association for environmental and social issues. Executive Director Brian Sullivan tells us about its aims and its importance to the industry and the wider world. Low-cost epifluorescence microscope techniques have delineated a prospective, relatively untested oil-prone fairway in the Cane Creek shale play, Paradox Basin, Utah. News of recent discoveries in both China and Myanmar signals a bright start to exploration in 2016. Mustafa As-Saruri, Ph.D., and Rasoul Sorkhabi, Ph.D.
Yemen’s petroleum resource base will be a critical part of reconstruction efforts once peace is restored, but this will require high-resolution exploration and development in both onshore producing basins and offshore frontier areas in the Gulf of Aden and the Red Sea. Yemen has plenty of potential – but the country’s war has significance far beyond its boundaries.